In this app note, we will show you how to use multiple subwoofers with the DDRC-88A. The primary reason for using multiple subwoofers is to improve evenness of bass response across the whole listening area. While Dirac Live will optimize the response to be the best it can across the listening area, it cannot correct for spatial variation. For example, if the level of 40 Hz in one seat is 10 dB different to the level in the next seat, the difference between the two seats will always be 10 dB, no matter how much EQ is applied. The only solutions are to find a better position for the (single) subwoofer, or to use multiple subwoofers. Multiple subwoofers can also help with other problems. For example, a persistent null in the response can be filled in by using multiple subwoofers. (A null is not just an area of low output, but an area of zero output. No amount of EQ can properly correct for a null.) Because real listening rooms are limited to where subwoofers can be placed (due to furniture, doors, and aesthetics), it may not be possible to locate a single subwoofer in the optimum position. Use of more than one subwoofer provides a greater degree of freedom with subwoofer location. The best place to start is with a single subwoofer. This will ensure that you have your DDRC-88A operating correctly and you are able to perform a calibration. It will also provide a "baseline" against which you can measure improvements from adding additional subwoofers. Figure 1. Single subwoofer connection to the DDRC-88A. Now we can run some measurements. We want to look at variation in bass response across the listening area, so more than one measurement location is needed. Three is probably the minimum, although the full nine would be excessively time-consuming. For this app note, we will use three locations: one in the middle of the listening area; one to the right, up and back; and one to the left, down and forward. Select the All (after) checkbox (and turn off all the others). Zoom in on the graph to view a frequency range from 20 to 200 Hz and a magnitude range from -20 to +10 dB. Graph 1. Illustrating spatial variation in equalized subwoofer response. So that's our baseline! Let's see what improvements we can get with more subs. Figure 2. Connecting two subwoofers to the DDRC-88A (powered). Figure 3. Connecting multiple subwoofers to the DDRC-88A (passive). Note that all subs are connected to a single channel of the DDRC-88A. 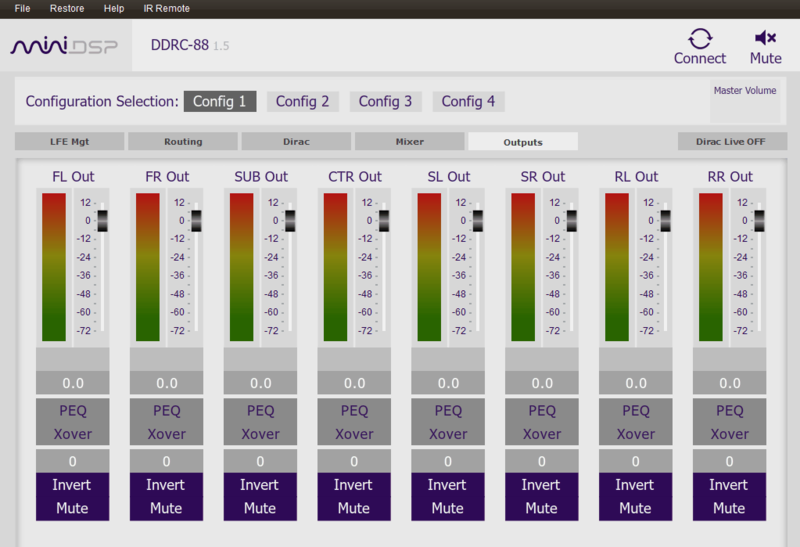 The behavior of low-frequency sound in a listening room is very complex, but this is a relatively straightforward way of obtaining a good result together with Dirac Live, as we will see in the following sections. Multiple subs can mean long audio cables and electrical equipment connected to different power outlets. This situation is a prime candidate for problems with noise and hum. Noise pickup is not usually an issue in a domestic environment, but balanced cabling and connections can reduce the chances of problems. More likely are ground loop problems. Running a long electrical lead so that a "far away" subwoofer is plugged into the same power board as the other electronics may be better than simply plugging that subwoofer into the nearest power outlet. The shield of a balanced cable can be disconnected at one end (e.g. disconnect "S" on the DDRC-88A end of the cable.) In extreme cases, audio isolation transformers may be necessary. Warning: never ever disconnect the safety ground of any equipment or use "cheater plugs." Doing so is extremely hazardous and may cause injury or death. If you do run into a ground loop problem, tackle it safely! Figure 4. Symmetrical layouts for multiple subwoofers. To test Method A, we placed two identical sealed subs in our test room as per Layout 1 above. The result (with the microphone in the same three locations as before) is shown in Graph 2 below. Graph 2. Equalized response of two subwoofers in the center of the front and rear walls. Below 60 Hz and from 85–100 Hz, the amount of spatial variation is low. Between 60 and 85 Hz, there are deep notches in some locations, but there isn't a deep wide "hole" anywhere as there is in Graph 1. So that's an improvement! Note also that our test room is not actually rectangular, so in a rectangular room the result may be better. Figure 4. Asymmetrical layouts for multiple subwoofers. With only S1 turned on, run your baseline measurement. It's best to record the result, so save the project and/or take screenshots. Our result is in Graph 3 below. Turn on S2 (leave S1 turned on) and run the measurements. If the result is better than step 1, proceed to the next step. Otherwise, change the parameters (*) of S2 and repeat. Our result is in Graph 4 below. Turn on S3 (leave S1 and S2 turned on) and run the measurements. If the result is better than step 2, you're done! Otherwise change the parameters of S3 and repeat. Our result is in Graph 5 below. (*) The "parameters" that can be changed depend on the functionality of your subs, but the main one is the gain. You can also adjust the phase control of the sub, or the delay if you have the subs connected via an external DSP unit like the (Balanced) miniDSP 2x4. Graph 3. Equalized response of a single subwoofer in front left corner. Graph 4. Equalized response after adding a second subwoofer at the center of the rear wall. Graph 5. Equalized response after adding a third subwoofer on the side wall. Each additional sub reduced the variation between the three measurement locations. We re-ran the measurements for each additional subwoofer only a couple of times, so it's possible that more time spent on varying sub parameters and measuring would yield even better results. Use of multiple subwoofers is not an excuse to use low-quality subwoofers! Low distortion, sufficient frequency extension and output, minimal cabinet vibration and driver self-noise, high quality electronics (if powered), and low port noise (if ported) are necessary attributes for good results, regardless of the number of subwoofers used. That's it for this app note! Have fun, and if you try this experiment with multiple subs and the DDRC-88A, please let us know your results in our forum.